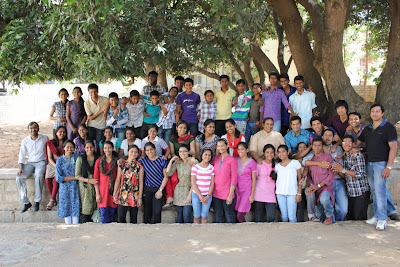 A 3 day Friendship with Jesus program – Salve 2012 was conducted by the Teens Ministry at Carmel Convent School, Banerghatta road for a group of 30 children from various parts of Bangalore, ranging from Classes VIII, IX, X and XI. Many of them had attended our previous summer camps. We were blessed to have the presence of Sr.Josna, the Principal of Carmel Convent School, all through the program. Fr. Antony Mahendran, Asst Parish Priest of Christha Prabhalaya Ephiphany Church and Fr. Varghese, National Pastor of JY celebrated the Holy Mass for us. Vinu (JY Teens National Team member) and Bangalore Teens Ministry members coordinated the program. The program consisted of music, prayers, sessions, activities, sharings and Eucharistic Adoration. As part of Outreach, we visited Swanthana, Home for mentally/physically challenged, run by the St.Camillus Sisters, on Sarjapur Road and spent time with the children there. The children and the volunteers treasured the time spent there as one of the most memorable moments of their lives.